FOR SALE: VINTAGE LIP NAUTIC-SKI ELECTRONIC. WONDERFUL WORKING CONDITION. 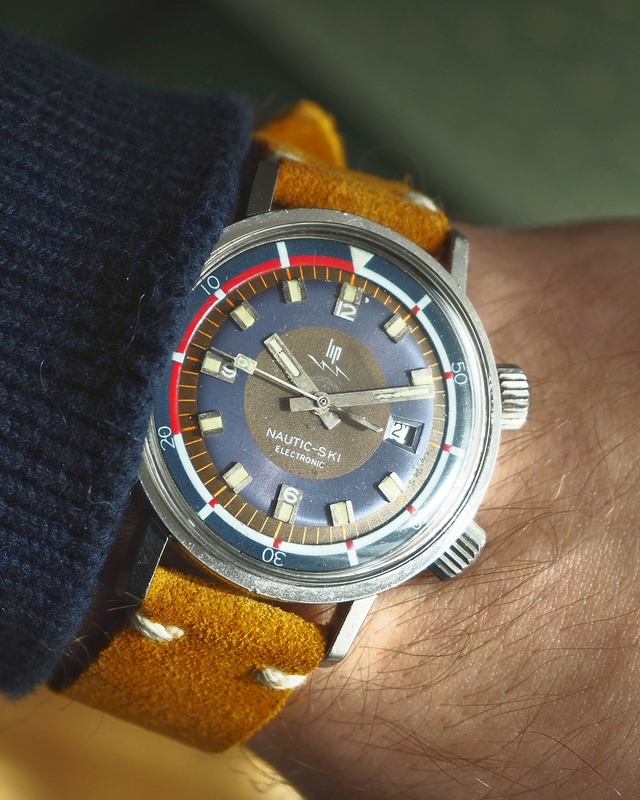 This watch was introduced in 1964, and it’s full of history. It’s produced by the french manufacturer LIP, and it was revolutionary: it was the world’s first electronic diver’s model. It’s powered by the R184 movement, although purists may hate it, it’s a robust movement with quite an interesting functioning: yes, it’s quartz, but it’s not your average quartz, The R184 uses a balance with improved switching and circuitry, needing only one battery. It has 14 jewels and a 18,000 beat movement (beats twice per second). It also features a hacking (stops the second hand when setting time) second hand movement. Lip sold the R184 to companies including Benrus, Elgin, Marvin, Universal Geneve, and Waltham. If this isn’t enough to convince you, just take a look at the price: it’s a steal! Supercompressor case, inner rotating bezel, date function, stainless steel case, and best of all: VINTAGE! These pieces don’t come up usually, so, you know what to do! Grab it before it’s long gone! Watch is located in Madrid, Spain. PRICE: FIRM 610€ SHIPPING INCLUDED IN THE EU, OTHER'S AT COST.